Just about every family has some story regarding ancestors passed down by word of mouth - and often written down at some point long after the fact. Other sources of information regarding ancestors are published obituaries from old newspapers - or articles involving ancestors in old newspapers that you might find on microfilm. Yet another source is the biographies of local citizens that were commonly published in conjunction with county histories. How good is this information? As always, it depends ... These sources are often really good starting points for research - but the accuracy depends on the knowledge of the original source of the information and how accurately it was communicated and recorded. As with any information source, look for ways to either verify or disprove it before accepting it as accurately representing part of your family history. Usually you will find that some of the information is accurate and some isn't - but the reliability of each of these sources varies. In general my experience has been that the most reliable of these sources is obituaries and the least reliable is family lore - but there are exceptions. The further back you go in time the more likely it is that obituaries were embellished by the writer to add interest or to burnish the reputation of the deceased. The published biographies and newspaper articles tend to be generally accurate but usually with some embellishment and commonly contain errors in some of the facts and dates. Family lore, if passed down orally for several generations, tends to have a core of truth regarding a significant happening in the past - but the details and facts have usually eroded through many tellings. In this column I'll cite some examples that I've encountered in my own family research. Your own experience will vary. I've found a lot of good information in obituaries and death notices throughout the years - but this one, published in Linn County, Kansas in 1899 was intriguing. Margaret Ann Dean Farris was the second wife of my gr.gr.grandfather, Jeremiah Farris. Grandma Ferris Dead One of the oldest inhabitants of Farlinville was Grandma Ferris and on Wednesday of last week she passed to the great beyond. She and her husband, who died several years ago, were among the oldest people of the county. Mr. Ferris in early manhood was a companion of Abraham Lincoln and frequently they split rails side by side. The deceased was buried last Friday. This is a combination of a family story, the above obituary of Margaret Ann Farris, the bio of a neighbor in Linn County, Kansas, and some related history. Page 270 - At Linnville and old man named Judge Farris was their neighbor. 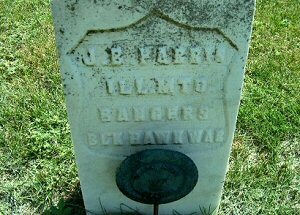 He was a veteran of the Black Hawk War and had a gruesome souvenir of that historic campaign. Farris had seen his brother killed and scalped by an Indian, and when he in turn killed the Indian he secured the scalp taken from his brother and kept it till his death when it was placed in his coffin and was buried with him in Richland graveyard. Note: Jeremiah Farris was instrumental in organizing the county government for Bremer County, Iowa when it was formed - and was elected the first County Judge. The family moved to Kansas a few years later - but the title of Judge or Squire stuck with him. While some members of the Farris family soon returned to Iowa, most, including Jeremiah and Margaret remained in Kansas. The following family story regarding Jeremiah and the Black Hawk War was known among several of the Kansas branches - and was related to me by the late Lloyd Farris who stated that he had heard it told numerous times by his grandfather, one of the sons of Jeremiah. 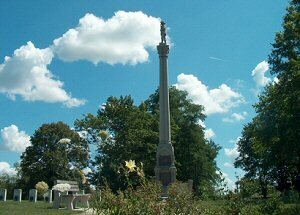 This relates to the Battle on Sycamore Creek in May, 1832 in Ogle County, Illinois. Jeremiah and two of his brothers were in the thick of the fight with the Indians. His brother Joseph was attacked by an Indian and had been shot. Jeremiah managed, somehow, to get Joseph on his horse with him and tried to escape - but his horse was shot out from under them. The Indians got Joseph, and he was killed, but Jeremiah managed to get away and was able to hide in some brush overhanging the stream. He stayed there until sometime after the battle when he was rescued. A somewhat similar account of this event is recorded in the Fulton County, Illinois History. There are fairly detailed accounts of the events around the Battle on Sycamore Creek recorded in various documents regarding the Black Hawk War. The military records document that Jeremiah was paid $90 after the war in compensation for the loss of his horse, his gun, and personal effects. 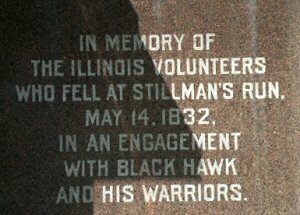 While there had been some attacks on individuals and settlements by Chief Black Hawk's Sauk & Fox warriors that had reentered Illinois from Iowa in 1831, this was their first actual engagement with an organized military unit. This unit of Mounted Volunteer Rangers from Fulton County was taken by surprise in their encampment on Sycamore Creek and were routed - with most fleeing and a few remaining to fight. Twelve of them were killed - including Joseph B. Farris. The unit was under the command of Major Isaiah Stillman - and Sycamore Creek afterward became known as "Stillman's Run". This unit had ventured out ahead of the rest of the military unit that had been organized to remove Black Hawk's people from Illinois. The day after the battle, a company from Sangamon County, Illinois arrived on the scene - and presumably rescued Jeremiah - but their main task was to gather the dismembered and mutilated remains of those who had been killed and bury them in a mass grave. All of the scalps of the dead had been taken by the Indians. One of the members of the Sangamon County unit was Private Abraham Lincoln. According to some accounts, the next day, that unit began following the trail of the Indians, who had headed north after the engagement. They followed the trail for several days - but did not catch up with them. However, by some accounts they did find where the Indians had abandoned the cooking utensils and camp goods and some of the personal goods that they had taken from the camp - along with the scalps of the men they had killed. There is no record of what happened to the scalps that were found - other than the account that Jeremiah was in possession of the scalp of his brother later in life. Abraham Lincoln, later in life, referred to this event in the Black Hawk War as his one personal military experience. It's quite possible that Jeremiah Farris encountered Abraham Lincoln during the Black Hawk War. But what about the account of them being companions when they were young? The Farris and Lincoln families lived a few miles apart in Kentucky at the time that Lincoln was born. But Jeremiah was only 10 when his family moved to southern Illinois - and Lincoln was even younger - and later moved to Indiana. After growing up in Franklin County, Illinois, Jeremiah moved to Fulton County, Illinois in 1827 - where he lived until 1851. During that period he served in a number of county government positions. Lincoln, who had moved to Illinois, had begun the practice of law during that time and was a Circuit Attorney covering a number of counties, including Fulton County, along with a Circuit Judge. So, again, there were opportunities where the two may have become acquainted. If so, there is no written record of that. So the account in Margaret's obituary couldn't be correct regarding them being companions in their youth (and splitting rails together). 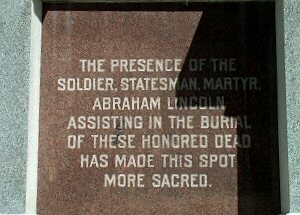 However, that story is probably an embellishment of the simple fact that Jeremiah had probably known Lincoln whom he had met either in Fulton County on occasions or during the Black Hawk War - or both. My experience in family history research has been that sources of information such as those referenced in this column should be used for general guidance. They may provide some insight regarding a family or an individual - but should not normally be accepted as fact without question and further research. They may contain some truth - and some ebellishment. But often they can lead you to other, more reliable sources of information.